Wakanda has been conquered, its Vibranium reserves plundered. Storm faces execution in the next 48 hours. And Dr. Doom stands triumphant. 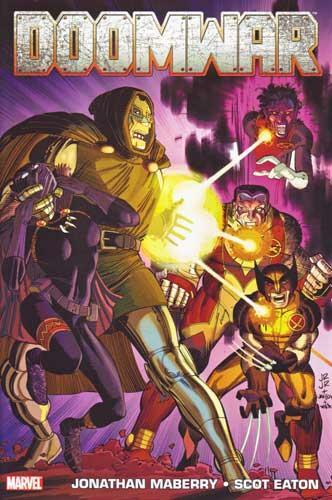 It will take the combined forces of the X-Men, the Fantastic Four and the two Black Panthers to stand against him. A war has begun that will pit the world’s most relentless super villain against a collection of the world’s most powerful super heroes–one that will span the globe, offering twists and turns and surprise players (hello Deadpool!) that neither side will see coming. Collecting Doomwar #1, #2, #3, #4, #5 and #6. Glad of that for I was reminded of what and over all great piece of work it is with plenty of striking art and a really engaging and effective story .”.Epic” truly does describe this story arc. And I would add that sincerity does not validate atrocity . I hope other writers do as good a job.